Issawi’s case stands out for several reasons aside from taking note of the length of his hunger strike. His expressed motivation was an understandable reaction to being rearrested in July 7, 2012 after having been released the prior year as part of the arrangement in which 1,027 Palestinian prisoners were given their freedom in exchange for the return of Gilad Shalit, the captured Israeli soldier. Issawi was rearrested at the Juba checkpoint, accused of violating the terms of his release that restricted him to Jerusalem, his place of residence. He was apparently still within the municipal limits of Jerusalem, but in an area treated as the West Bank by the Occupation authorities, and even so was claiming only to be seeking a shop for the repair of his car. For this possible technical violation of the release agreement, he was sentenced to eight months in prison, but then additional to this, a special committee, acting under Military Order 1651, Article 186, used its authority to rule that someone rearrested in this way could be returned, on the basis of a secret file, to prison for the completion of his original sentence, which in Issawi’s case meant twenty years. There was no right to challenge such a seemingly outrageous ruling. Even Issawi’s lawyer was denied access to the file that contained the supposedly incriminating information. It was against this background that Issawi was unwilling to accept a reversal of his release from jail. He declared that a hunger strike was the only weapon available to him to protest such treatment, implying that he would either win his freedom in that way or die in prison. whatever they wish, hide behind veils of secrecy, and impose their authority by relying on excessive force and a variety of humiliating obstacles to normalcy. Issawi made clear that his struggle would not end with his release from prison: “It is our obligation as freedom fighters to free all Palestinian political prisoners.” Also, that there was a link between his kind of resistance by Palestinians and the broader international solidarity movement: “I draw my strength from all the free people in the world who want an end to the Israeli occupation.” Of course, there is mutuality present as those who support the Palestinian struggle from outside are inspired by the courage and resilience of individuals such as Samer Issawi, and should know these stories of nonviolent Palestinian defiance. remaining silent for a long time, Robert Serry, the UN Envoy to the Middle East, a few days ago timidly issued a public statement saying that he was ‘deeply troubled’ by the near death condition of the Mr. Diab and Mr. Halahleh. freedom and dignity of all, no matter where. We are all responsible and we will all lose if we anything happen to them. immediately, or their children could never forgive us. Can anyone doubt that if there were more than 1300 hunger strikers in any country in the world other than Palestine, the media in the West would be obsessed with the story? It would be featured day after day, and reported on from all angles, including the severe medical risks associated with such a lengthy refusal to take food. At this time two Palestinians who were the first to start this current wave of resistance, Thaer Halaheh and Bilal Diab, entering their 64th day without food, are reported by the prisoner protection association, Addameer, and the NGO, Physician for Human Rights-Israel, to be in critical condition with their lives hanging in the balance. Despite this dramatic state of affairs there is scant attention in Europe, and literally none in North America. It is the case that prison protests, even large-scale ones such as occurred in California a year ago often attract little national and international notice unless deaths occur, as happened in the famous Maze Prison IRA hunger strikes back in 1981, but to ignore this expression of Palestinian resistance in the overall context of the conflict with Israel is lamentable. After all, as an occupying power of Palestinian territories Israel has a particular responsibility to the international community. Broader issues are also at stake. When in the past Palestinians resorted to violent forms of resistance they were branded by the West as terrorists, their deeds were covered to bring out sensationalist aspects, but when Palestinians resort to nonviolent forms of resistance, whether hunger strikes or BDS or an intifada, their actions fall mainly on deaf ears and blind eyes, or worse, there is a concerted propaganda spin to depict the particular tactic of nonviolent resistance as somehow illegitimate, either as a cheap trick to gain sympathy or as a dirty trick to destroy the state of Israel. All the while, Israel’s annexationist plans move ahead, with settlements expanding, and now recently, with settler outposts, formerly illegal even under Israeli law, in the process of being retroactively legalized. Such moves signal once and for all that the Netanyahu leadership exhibits not an iota of good faith when it continues to telling the world that it is dedicated to negotiating a peace treaty with the Palestinians. It is a pity that the Palestinian Authority has not yet had the diplomatic composure to call it quits when it comes to heeding diversionary calls from the Quartet for a resumption of yet another round of meaningless direct talks. It is long past time to crumble bridge to nowhere. That rock star of liberal pontificators, Thomas Friedman, has for years been preaching nonviolence to the Palestinians, implying that Israel as a democratic country with a strong moral sensitivity that would yield in the face of such a principled challenge. Yet when something as remarkable as this massive expression of a Palestinian commitment to nonviolent resistance in the form of this open-ended hunger strike, dubbed ‘the war of empty stomachs’, takes place, Friedman along with his liberal brothers is stony silent, and the news sections of the newspaper of the New York Times are unable to find even an inch of space to report on these dramatic protests against Israel’s use of administrative detention and abusive treatment during arrest, interrogation, and imprisonment. Shame on you, Mr. Friedman! Let there be no mistake about the moral and spiritual background of the challenge being mounted by these Palestinians. Undertaking an open ended hunger strike is an inherently brave act that is fraught with risks and uncertainties, and is only undertaken as an expression of extreme frustration or acute deprivation. It is not an act undertaken lightly or as a stunt. For anyone who has attempted to express protest in this manner, and I have for short periods during my decade of opposition to the Vietnam War, it is both scary and physically taxing even for a day or so, but to maintain the discipline and strength of will to sustain such a strike for weeks at a time requires a rare combination of courage and resolve. Only specially dedicated individuals adopt and maintain such a tactic. For a hunger strike to be done on such a scale of collective action underscores the horrible ordeal of the Palestinians that has been all but erased from the political consciousness of the West in the hot aftermath of the Arab Spring, and may also point to a wider willingness of Palestinians to mount their own version of Tahrir Square. The world has long refused to take notice of Palestinian one-sided efforts over the years to reach a peaceful outcome of their conflict with Israel. It is helpful to recall that in 1988 the PLO officially accepted Israel within its 1967 borders, a huge territorial concession, leaving the Palestinians with only 22% of historical Palestine on which to establish an independent and sovereign state. In recent years, the main tactics of Palestinian opposition to the occupation, including on the part of Hamas, has been largely to turn away from violence, adhering to a diplomacy and practice that looked toward long-term peaceful coexistence between two peoples. Israel has not taken note of either development, and has instead continuous thrown sand in Palestinian eyes. The official Israeli response to Palestinian moves toward political restraint and away from violence have been to embark upon a program of feverish settlement expansion, extensive targeted killing, reliance on excessive retaliatory violence, as well as an intensifying oppressiveness that gave rise to these hunger strikes. One expression of this oppressiveness is the 50% increase in the number of Palestinians held under administrative detention during the last year, along with an officially mandated worsening of conditions throughout its prison system. She had previously been held in administrative detention at the HaSharon prison in Israel for a 30 month period between 2009 and 2011, being released in the prisoner exchange of four months ago that freed 1027 Palestinians and the lone Israeli soldier captive, Gilad Shalit. Since her release she has been trying to recover from the deep sense of estrangement she experienced in prison, and rarely left her home or the company of her family. As she was returning to normalcy she was re-arrested in an abusive manner, which allegedly included a strip-search by a male soldier. 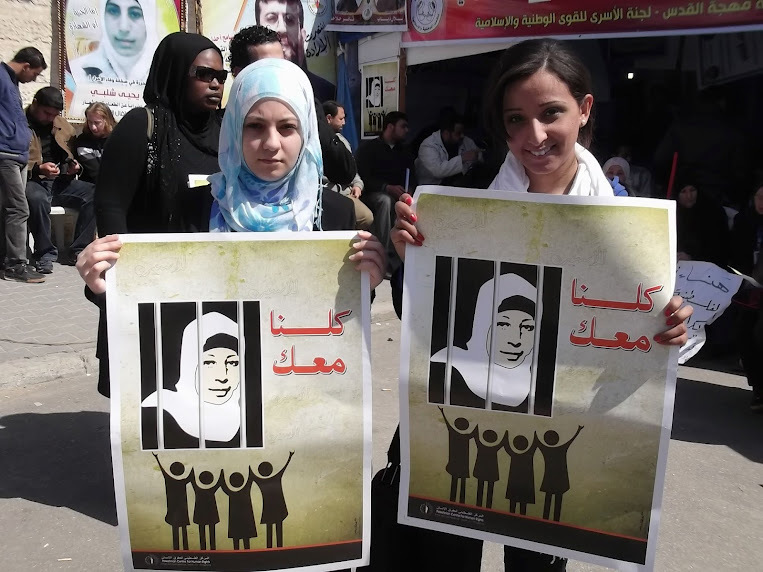 On February 16, 2012, the day of this renewal of her administrative detention, Hana Shalabi indicated her resolve to start a hunger strike to protest her own treatment and to demand an end of administrative detention now relied upon by Israel to hold at least 309 Palestinian in prison. 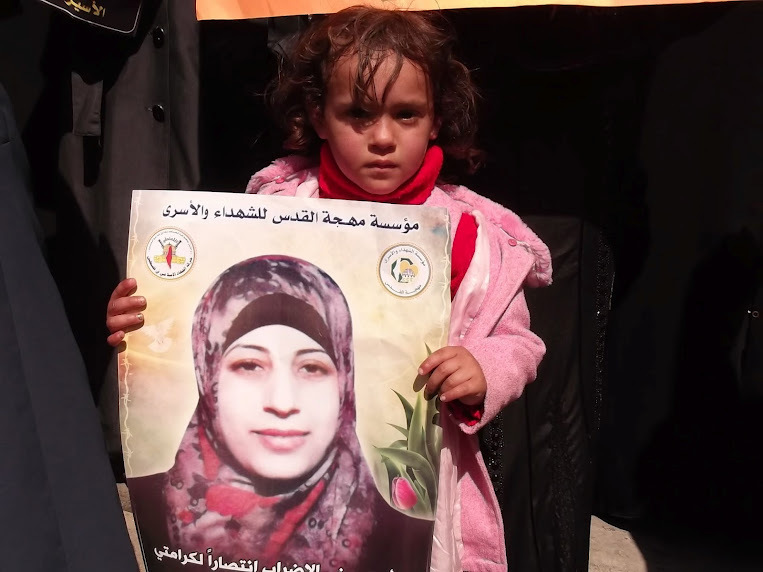 Her parents have been denied visitation rights, Hana Shalabi has been placed in solitary confinement, and her health has deteriorated to the point of concern for her life. 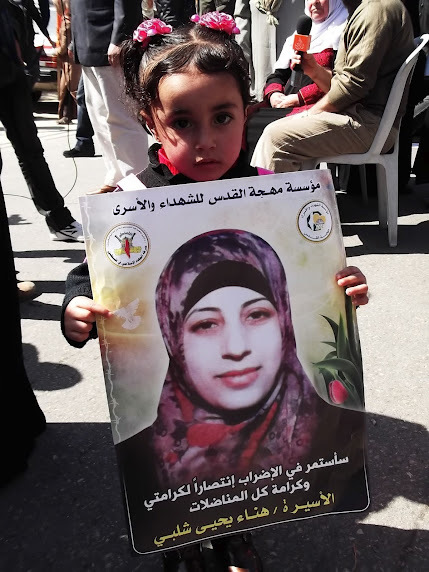 Impressively, her parents have committed themselves to a hunger strike for as long as their daughter remains under administrative detention. Her mother, Badia Shalabi, has made a video in which she says that even to see food makes her cry considering the suffering of her daughter. In the meantime, we who are beyond these zones of occupation, abuse, and imprisonment must not only stand and watch as this tragic drama plays itself out. Wherever we are, whatever we can do, we need to act, to appeal, to shout, and to denounce the inhumanity of allowing such cruelty to be enacted before our watching eyes. I am making available here my latest report to the UNGA in my role as Special Rapporteur on Occupied Palestine. Because of translation requirements within the UN the early deadline for submission of the text means that recent developments are omitted, including the issuance of the Palmer Report on the flotilla incident of 31 May 2010, the statehood bid put forward by the PLO/PA in the historic speech of Mahmoud Abbas on 23 September 2011, and the very recent prisoner exchange that freed over 1000 Palestinians and the Israeli soldier, Gilad Shalit, but has left over 5,000 Palestinians in captivity. These issues are dealt with briefly in my oral presentation to the Third Committee of the General Assembly on 20 October 2011, and I will put here an edited version of that text in a few days. follow-up reports by the Committee of Independent Experts.2 The reports of the Committee of Independent Experts took particular note of the failure by Israel to conduct investigations of alleged war crimes in a manner that accords with international standards. Advisory Opinion, I.C.J. Reports 2004 (see also A/ES-10/273 and Corr.1). The International Court of Justice concluded in its advisory opinion that the Fourth Geneva Convention was applicable in the Palestinian territories, which before the 1967 conflict lay to the east of the Green Line and which, during that conflict, were occupied by Israel. 6 See Bekkar, “The United Nations General Assembly Requests a World Court Advisory Opinion on Israel’s Separation Barrier”, Insights, December 2003.
from agricultural land.7 Weekly demonstrations against the Wall have continued, especially in Palestinian villages near Nablus, most prominently in the villages of Ni’lin and Bil’in. As with other issues of violations of international law by Israel, there continues to be a lack of will within the United Nations, and especially among its Member States, to challenge the existence and continuing construction of the Wall, which intrudes so negatively on the lives of many Palestinians living under occupation in the West Bank, especially East Jerusalem. 9. It is worth recalling the language of mutuality and rights emphasized in the Balfour Declaration of 2 November 1917, which underpins the founding of Israel, even now, almost a century after it was issued: “… it being clearly understood that nothing shall be done which may prejudice the civil and religious rights of existing non-Jewish communities in Palestine”. This explicit acknowledgement of support in the contested declaration for the establishment of what was then called “a national home for the Jewish people” is the foundation of the claim of right relied upon in the establishment of the State of Israel, and its recognition and admission to membership by the United Nations in 1948. Although the Balfour Declaration was a colonialist overriding of the right of self-determination that was later recognized in international law, its insistence on showing respect for the reciprocal rights of the non-Jewish communities affected, particularly the Palestinians, should continue to provide political and moral guidance in the search for a peaceful and just solution to the conflict. 7 In June 2011 Israel began dismantling a section of the barrier near the West Bank village of Bil’in, in compliance with a decision of the High Court of Justice of Israel four years earlier. See Office for the Coordination of Humanitarian Affairs, “Protection of Civilians Weekly Report, 8-21 June 2011”, 24 June 2011. Available from http://unispal.un.org. concession by the Palestinian leadership, as it reduced to 22 per cent the approximately 45 per cent of historic Palestine apportioned by the United Nations as belonging to the Palestinians in General Assembly resolution 181 (II). This partition arrangement was rejected in 1947 by leaders of both the resident Palestinian population and the neighbouring Arab Governments at the time, because they deemed it unfair and unacceptable. Palestinian self-determination continues to be widely understood in the international community to be based on the establishment of a viable and contiguous State within the totality of the 1967 borders, subject to agreed small-scale adjustments and equivalent land swaps. This position was reaffirmed by President Obama of the United States of America in May 2011.8 Innumerable efforts, by way of direct negotiations between the parties, to transform this consensus into a solution have failed, contributing to intense disillusionment among the Palestinians and their leadership. It should be further observed that delay in finding a solution has continuously diminished Palestinian prospects for a viable State, especially because of Israeli settlement expansion, the construction of the Wall and the relating network of Israeli settler-only roads. 8 Barack Obama, President of the United States, “Remarks by the President on the Middle East and North Africa”, White House press conference, Washington, D.C., 19 May 2011. Available from http://www.whitehouse.gov/the-press-office/2011/05/19/remarks-president-middle-east-and- north-africa. 9 See Office of the Quartet Representative, “Quartet principals meet with Tony Blair in Washington, D.C., to promote direct negotiations”, 11 July 2011. Available from http://www.tonyblairoffice.org/quartet/news-entry/quartet-meet-in-washington-dc-to-promote-direct- negotiations/. others, it is being condemned as “unilateral” and vigorously opposed by the Governments of Israel and the United States. 11 See, for example, Nir Hasson, “The Orthodox Jews fighting the Judaization of East Jerusalem”, Haaretz (Tel Aviv), 24 June 2010. Available from http://www.haaretz.com/weekend/magazine/the- orthodox-jews-fighting-the-judaization-of-east-jerusalem-1.298113. 12 See Security Council resolutions 252 (1968), 446 (1979) and 478 (1980). 13 Information received from the United Nations Relief and Works Agency for Palestinian Refugees in the Near East and the Office for the Coordination of Humanitarian Affairs during mission. See also Office for the Coordination of Humanitarian Affairs, Special Focus: East Jerusalem: Key Humanitarian Concerns, March 2011. 14 See, for example, Defence for Children International — Palestine Section, “In their own words: a report on the situation facing Palestinian children detained in the Israeli military court system”, February 2011. Available from http://www.dci-pal.org/English/Doc/Press/EASTJerusalem_ JANUARY2011.pdf. 15 See, for example, United Nations Children’s Fund, “UNICEF oPt monthly update, July-August 2011”. Available from http://www.unicef.org/oPt/UNICEF_MonthlyUpdate_July_and_ August2011.pdf. the United Nations, the International Committee of the Red Cross and key Member States to meet this challenge. 16 For useful exposition of the separation of prisoners from their families for long periods of time, producing great suffering, see discussion by Israeli lawyer Michael Sfard, “Devil’s Island: the transfer of Palestinian detainees into prisons within Israel”, in Threat: Palestinian Political Prisoners in Israel, Abeer Barker and Anat Matar, eds. (London: Pluto Press, 2011). This book contains a valuable overview of these problems, and results from a conference held in Israel, a tribute to Israeli democratic freedoms for its own citizens. 19 Letter from President Bush to Prime Minister Sharon, dated 14 April 2004. Available from http://georgewbush-whitehousearchives.gov/news/releases/2004/04/20040414-3.html. See also Ethan Bronner, “Netanyahu responds icily to Obama remarks”, New York Times, 19 May 2011. Available from http://www.nytimes.com/2011/05/20/world/middleeast/20mideast.html?_r=1. 20 It is noted that even treaties, which are a stronger form of agreement than this exchange of letters by the respective leaders of Israel and the United States, cannot affect Palestinian rights under international law. Article 34 of the Vienna Convention on the Law of Treaties clearly affirms this principle: “A treaty does not create either obligations or rights for a third State without its consent.” Even should Palestine not be a State, it is certainly a party, and has been so regarded by all concerned Governments. during mission. See also Office for the Coordination of Humanitarian Affairs, Special Focus: East Jerusalem. 27. There has been a serious increase in settler violence in 2011. The Office for the Coordination of Humanitarian Affairs reports a more than 50 per cent increase in incidents in the West Bank involving violence against Palestinians, documenting injuries to 178 Palestinians during the first half of 2011 as compared to 176 for the entire year of 2010.24 According to UNRWA, those injured in settler violence in just the first half of 2011 included 12 children. These specific injuries resulted from stone- throwing, assaults and shootings by Israeli settlers. Yet these incidents only tell part of the story. There are almost daily accounts of settler vandalism against Palestinian agricultural land and villages, with several incidents videotaped by individuals working with B’Tselem, the highly regarded Israeli human rights organization.25 There have been numerous reports of agricultural land and olive groves being burned, especially in the villages around Nablus.26 Also part of this disturbing set of developments is a pattern of passive support for settler activities exhibited by Israeli security forces and border police. It often takes the form of shooting tear gas and stun grenades at Palestinians while doing nothing to stop settler violence and vandalism, and has also been documented by B’Tselem video cameras.27 A further dimension to these activities is the frequent settler harassment of Palestinian children on their way to school — also not prevented by Israeli forces — which has reportedly discouraged many children and their families from attending school, thereby violating their right to education. In some areas, most consistently in Hebron where settler violence is frequent and severe, international civil society organizations such as Christian Peacemaker Teams and the Ecumenical Accompaniment Programme in Palestine and Israel have attempted to step into the breach, providing direct protection of young schoolchildren when Israeli forces do not meet their obligation to prevent settler violence.28 Overall, the failure by Israel to prevent and punish settler violence remains a serious and ongoing violation of its most fundamental obligation under international humanitarian law to protect a civilian population living under occupation, and to accord particular protection to children as specified in Protocol I, article 77. 24 Information received from the Office for the Coordination of Humanitarian Affairs during mission. 25 Available from http://www.btselem.org/video/search/22. See also Muadi Nadder, ed., An Unjust Settlement: A Tale of Illegal Settlements in the West Bank (Geneva, Ecumenical Accompaniment Programme in Palestine and Israel, 2010). 26 Information received from UNRWA and the Office for the Coordination of Humanitarian Affairs during mission. (Geneva, Ecumenical Accompaniment Programme in Palestine and Israel, 2010). 29 See “Terror attack in Itamar: 5 family members murdered”, Jerusalem Post, 12 March 2011.
by the Government of Israel for a policy of ethnic cleansing, especially in East Jerusalem, and their claim of biblical birthright to the entire West Bank;30 and a signal to the Government that any future anti-settler moves by Tel Aviv, such as closing settler outposts established without official permission, would be met with what settlers themselves call “price tag” reprisals against Palestinians and their properties.31 Maher Ghoneim, the Palestinian Authority Minister charged with monitoring settlement activity, declared: “This is a government of settlers and its program is one of settlement. This naturally encourages this arrogance and these attacks.”32 Israeli political leaders refer to the West Bank as “Judea and Samaria”, indirectly reinforcing the insistence by religious Israeli settlers that this territory should as a whole be incorporated into or annexed by Israel, and that it is the Palestinians who are the usurpers of the historic and religious entitlements of Jewish settlers. 30 See, generally, B’Tselem, “By hook and by crook: Israeli settlement policy in the West Bank”, July 2010; and B’Tselem, “Dispossession and exploitation: Israel’s policy in the Jordan Valley and northern Dead Sea”, May 2011. Available from http://www.btselem.org/publications. from http://uk.mobile.reuters.com/article/worldNews/idUKTRE76D30220110714. 33 “EU: New settlement building units are obstacle to peace”, Jerusalem Post, 19 July 2011. 34 UNRWA, “Demolition watch”, 12 June 2011. Available from http://reliefweb.int/sites/ reliefweb.int/files/resources/Full_Report_1154.pdf. child’s age and the desirability of promoting a child’s reintegration and the child’s assuming a constructive role in society”. This approach reflects the general directive of article 77 (1) of Protocol I: “Children shall be the object of special respect.” It is against this background that the pattern of deleterious treatment of Palestinian children living under occupation, as confirmed by many testimonies received during the Special Rapporteur’s mission and published reports of respected NGOs, confirms continuing violations by Israel of international law, in particular international humanitarian law. 35. Many of the arrests of Palestinian children arise out of allegations of stone- throwing aimed at settlers or Israeli security personnel in the West Bank.35 Those accused, unlike Israeli children in the West Bank, are subject to Israeli military law, which offers far fewer protections for minors than are present in Israeli criminal law. Most relevantly, in military law there is an absence of protective provisions regarding the presence of a parent during interrogation, the hours that the interrogation must be conducted or respect for the dignity of the child during the arrest process. The arrest procedures documented by United Nations agencies and reliable human rights organizations include arrests in the middle of the night without prior notification, removal of the child from parents for questioning, abusive treatment in detention and conviction procedures that appear to preclude findings of not guilty. During our mission we were frequently told that these arrest procedures seemed systematically intended to frighten and humiliate those arrested, and to turn them towards collaborating by identifying protest leaders in demonstrations and refraining from anti-occupation activities in the future. 36. In the period between 2005 and 2010, 835 children were prosecuted for stone- throwing, of which 34 were 12 or 13 years old, 255 were 14 or 15, and 546 were 16 or 17.36 Since 2007 the number prosecuted has risen each year. The length of the sentences did take into account the age of the accused, varying from more than a year for older children to a few weeks for younger ones. Israel did establish a youth military court in 2010, and so far its sentences for children in the 12 or 13 year-old category have been lighter, with the longest sentence imposed being nine days, which is far less than in earlier years. The very existence of a military court for children is inconsistent with international humanitarian law’s fundamental commitment to uphold, pursuant to article 40 (1) of the Convention on the Rights of the Child, “a child’s sense of dignity and worth”. B’Tselem has expressed its main finding on this topic as follows: “The present report indicates that the rights of minors are severely violated, that the military law almost completely fails to protect their rights, and that the few rights granted by law are not implemented.”36 Among the serious results of this way of handling Palestinian youth accused of transgressions is the denial of their educational possibilities while in custody or prison, and the disallowance of their ties with families, which go against international legal standards. This abuse also inflicts fear and suffering on parents and other family members who witness the arrest procedures and are not even informed about where their child is being held in custody. 35 See, generally, B’Tselem, “No minor matter: violation of the rights of Palestinian minors arrested by Israel on suspicion of stone-throwing”, July 2011; and B’Tselem, “Caution: children ahead: the illegal behavior of the police towards minors in Silwan suspected of stone-throwing”, December 2010. Available from http://www.btselem.org/publications. 36 B’Tselem, “No minor matter: violation of the rights of Palestinian minors arrested by Israel on suspicion of stone-throwing”, July 2011. 2011. Available from http://electronicintifada.net/content/trauma-palestinian-children-increasing- say-health-groups/10212. 42 Philip Weiss, “Col. Travers: Israel’s treatment of Palestinian children shows that it does not seek peace”, 11 July 2011. Available from http://mondoweiss.net/2011/07/col-travers-Israels-treatment- of-palestinian-children-shows-that-it-does-not-seek-peace.html. 43 UNRWA, “A goal for Gaza: at 2011 Summer Games, 2,011 children set football world record”, 14 July 2011. Available from http://unispal.un.org/UNISPAL.NSF/0/E014A7DE55B9E6B0852578 CD0065C530. 44 UNRWA, “Gaza blockade anniversary report”, 13 June 2011. Available from http://www.unrwa.org/ etemplate.php?id=1007. community “to ensure that repeated appeals by States and international organizations to lift the closure are finally heeded”. It ends with this appeal: “We endorse these calls for accountability, because we need to lift the blockade and give the kids of Gaza a chance to fulfil their true potential.”43 As an aspect of the multidimensional crisis facing Gaza, UNRWA itself is experiencing a funding crisis that already is impinging on its capacity to continue even at present levels to provide for the 80 per cent of the Gazan population that is currently dependent on international assistance for subsistence, and lacks the resources to meet the additional needs of Gaza’s families, which of course encompasses the children. 42. What is said about Gaza is only a shade less true for the West Bank, including East Jerusalem, where the ordeal of prolonged occupation weighs heavily on the future prospects of children living in an atmosphere of fear and intimidation from birth onwards. Recent developments in Area C, which is 60 per cent of the West Bank, are in their own way as severe in their deprivation of rights as the situation in Gaza, especially in relation to the displacement and dispossession of Bedouin villages that have created a general atmosphere of fear and foreboding, especially among Bedouin children.45 According to UNRWA field staff with whom the Special Rapporteur met during the mission, the 155 herding communities left in Area C, which is fully controlled by Israel, include many Bedouin refugees now facing forcible displacement. Those communities, including many children now largely without regular access to schools, have dramatically deteriorated since 2000, with half the population having been forced out of the West Bank grazing areas, losing their herds and involuntarily ending up in small towns and villages. Part of this forced displacement and forced urbanization has been the result of an Israeli policy of systematic demolition of the traditional cistern-based water infrastructure essential for maintaining the Bedouin people’s nomadic and agricultural way of life, which the occupying Power contends is unlicensed, and thus subject to removal. Bedouin children, most of whose families have already been made refugees in the past, face the particularly difficult challenge of losing their homes and entire way of life as a result of this forced abandonment of their herding traditions, as well as being denied the protection of citizenship associated with upholding the dignity and rights of individuals. 45 See Harriet Sherwood, “Bedouin children hope their West Bank school will be spared Israel’s bulldozers”, Guardian, 12 June 2011. 46 See UNICEF, “Protecting children from unsafe water in Gaza: strategy, action plan and project resources”, March 2011. Available from http://www.unicef.org/oPt/FINAL_Summary_Protecting_ Children_from_unsafe_Water_in_Gaza_4_March_2011.pdf.